I was exhausted. I was drenched in sweat. I was filled with an inexplicable joy like I had never known before. 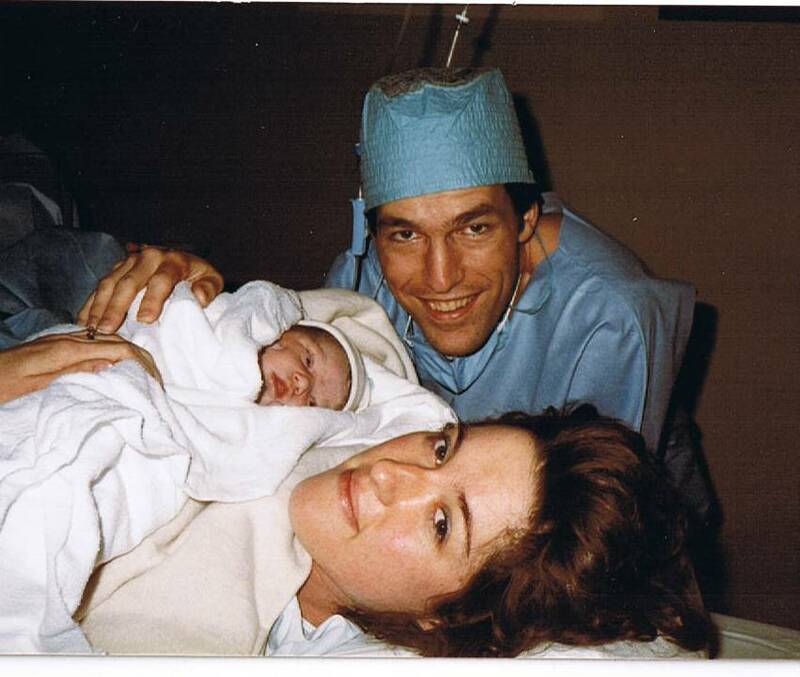 It was the day Steven Hugh Jaynes Jr. emerged from my womb and made his grand debut into the world. Before my son was born, I never knew so much love could be wrapped in one tiny package. After twenty-three and a half hours of pushing and pulling, heaving and ho-ing, he finally decided to leave his comfy sauna and face the bright lights of the delivery room. As soon as the umbilical cord was severed, the nurses whisked him away to make sure ten fingers and toes were accounted for, wrap him in a cozy blanket, and place a cap on his fuzzy head. We got to visit for a little while, this new little person and I, but alas they needed to run a few more tests to make sure all was well. A short time later, a nurse brought my little man to my room, placed the squirmy bundle on my chest, and smiled. Steven’s head bobbed about like he was looking for something. He whimpered. He searched. And then he found what he was rooting for. Steven latched on to my body, and the miracle began. Nourishing, life-giving sustenance began to flow. And for the first time I truly understood the name El Shaddai. The word Shaddai describes power, but not in the usual thunder-and-lightning sense. This is the power to nourish, to sustain life, to quiet one’s longings. The Hebrew root word shad may seem an odd choice for referring to God. But if you have ever held a hungry, crying, restless, or anxious babe in your arms and then witnessed the calm that sweeps over him when placed to his mother’s breast, you understand. The crying ceases, the restlessness calms, the hunger is satisfied, and anxiousness melts away. And to that child, the mother from whom life-giving, soul-satisfying nourishment flows seems all powerful. What a beautiful image of our God who satisfies our every need, calms our every fear, and soothes our every longing. No matter what you’re going through today, you can cling to the truth that God is El Shaddai, the All-Sufficient One. He has within Himself the life-giving sustenance you need…the life-giving sustenance your heart longs for. Right now, close your eyes and imagine being wrapped in God’s arms and resting on His chest. Go ahead. Give it a try. When you open your eyes, leave me a comment and tell me how it makes you feel knowing that God is El Shaddai – the all sufficient One. If you’d like to learn about the names of God, Gwen Smith, Mary Southerland and I have a brand new book titled Knowing God by Name.It has 8 weeks of devotions that focus on 40 names of God. You can take a peek, buy now, ordownload a free chapter at www.localhost/sjold. Loved this….thinking of God this way makes me feel safe and protected. It’s interesting that this was your post today. I happened to be thinking of how much I could use a cuddle from God just yesterday. In fact when I was out for my walk with my dog I had this warm feeling that He was walking right there beside me. I could almost feel us holding hands. Such a warm feeling. It’s wonderful to feel that loved by someone so Great, especially when you don’t feel loved by the world. Thank you Sharon for this posting. A wonderful way to start my day as I eagerly anticpate my children’s arrival home from their 12 day adventure away from home. Wow! I can imagine MY Humongous Father holding me with my face on His knee telling me everything is all right! Don’t Worry!!!! Looking up into the most peaceful eyes !. El Shaddai moving me from the breast milk of this world to the breastplate of His righteousness! Peaceful , very peaceful I did not want to open my eyes. Being wrapped in the arms of God is an awesome feeling. I am a widow and God is my husband . He is an awesome God. He makes me feel secure. I have been following the Girlfriends website for some time now and gain great strength and encouragement from you all. I have two sons who are now adults and so relate to your words and the poem you shared. However, I need to ask for some guidance. I was diagnosed with RA about 12 years ago and have done well over this period of time until this summer when my body seems to be “heading south” in a hurry with substantial increase in pain throughout my joints. I have been prayed over by my pastor and elders of the church and am trying so hard to believe in the God who heals – not only our soul and, but our body – it is a battle when my face looks like the 10 in the doctor’s office (sometimes a 12). I really need help in how to hold close to God and battle through this incredibly difficult time. Please reply to my email @ epalach@gmail.com. I enjoyed your post immensely ..I often imagine myself sitting at the feet of our God .. drinking in his love and wisdom and being held In his arms ..It recalls to mind that song by Amy Grant that talks about “what will I do when I meet you” ..or something to that degree .. “will I dance?” “Will I fall upon my knees?” … I love that song .. because it draws me close to him imagining what I will do when I meet him in heaven. Thanks for all your writing and all you share ! There’s something missing in my brain, I think….I can’t imagine or picture and I know I’m missing out on so much. I can only deal in black and white. Oh that God would give me the ability to feel what. You all are feeling. I imagine this often. It’s the only way I feel truly protected, safe, and warm. It made me feel at peace and that I was safe and that I was protected. Makes me feel just like a little girl, again! Up on Daddy’s lap – where “all is well” & I am perfectly safe, protected & “spoiled”! I LOVE my, Daddy God!!! I feel loved and safe, able to rest without being watchful or anxious. Someone is watching out for me, watching over me, allowing me to get the peaceful rest I need. MY MUSCLES RELAXED, MY HEAD FELL INTO A RELAXED DROOP AND ONE BIG DEEP CLEANSING BREATH AND I WAS ONCE AGAIN READY TO DEAL WITH ALL MY MEDICAL CHALLANGES BY RELAXING AND HEARING HIM SAY.” :I LOVE YOU” I AM YOUR EL SHADDI. The feeling that comes over me when I close my eyes and imagine being in God’s loving arms is one of contentment and peace. I feel the warmth of being cared for and loved unconditionally. It is a glorious feeling. I FELT LIKE HEAVEN JUST CAME DOWN INSIDE MY ROOM AND JEHOVAH SITTING HERE, WITH ME AT HIS FOOT. TEARS OF JOY ARE JUST ROLLING DOWN. OH, WHAT A BLISS! THANKYOU SOOO MUCH FOR YOUR POSTS SHARON! GOD BLESS! I never pictured it that way as how calming it with a child when they latch on and sustain what they need. Thank you for that example. What a perfect example it is though. For I know that with out God I am like a helpless baby, crying and reaching out for someone to sustain me. I am so glad that I have God that will never ever let me go. Thank you for that reminder that God is looking down on us and we need to keep our eyes focused on our eternal father. It’s a beautiful feeling that I am loved. Content, secure, ad special! Thank you for sharing this beautiful story as an example. God is faithful and true. In reading this just confirms my reading this morning…..
this morning i was reading psalms 91 in the message verson it says “You who sit down in the High God’s presence, spend the night in Shaddai’s shadow, Say this: “God, you’re my refuge. I trust in you and I’m safe!” That’s right—he rescues you from hidden traps, shields you from deadly hazards. His huge outstretched arms protect you—under them you’re perfectly safe; his arms fend off all harm. He just continues to reassures me that no matter what i am going thru He is my All Sufficient one” my protector. How I love Him. feeling, secured and loved by my heavenly Father. I close my eyes and I am wrapped in Gods loving arms……peace that surpasses all understanding! Loved and at Peace with my loving “All Sufficient”Savior! Praise His name! I feel covered… Nothing can touch me, I’m wrapped in Jesus arms out of harms way. Knowing that God is El Shaddai, the All-Sufficient One is just what i need to be reminded of especially today. They have been laying off people on my job for the last months. Thanks !!!!!!!!!!! Thanks Sharon for that great reminder that my God is all powerful and can provide whatever I need!! HE is El Shaddai, amen?? I’m very blessed by this study;) thank you. I especially needed this reminder again! That our God is our Provider. Nothing is too hard for Him to accomplish and that I just need to keep trusting HIs heart of goodness in my life to make a way when there seems to be no way. Thank You Lord for what you will accomplish for my good and Your glory in my difficult situation! !